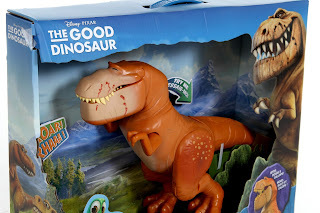 Back in October of last year, I reviewed the entire line of TOMY The Good Dinosaur action figures in three parts (Part 1, Part 2 & Part 3- check 'em out! ); but you might have noticed one was left out. Well, here he is at last- the fantastic Galloping Butch! 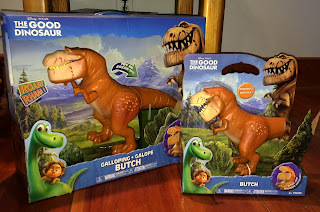 Though I also purchased the basic "extra large" figure of Butch (see in Part 3), that one is a lot smaller and does not have any sounds or action features; So I couldn't resist getting this one as well! Last summer at the D23 Expo, a representative at the Good Dino TOMY booth mentioned to me that the Galloping Butch here is actually much more accurately in scale with the rest of the action figure line and is meant to be included with that assortment. This Butch is about 15" tall and 18" long. It's pretty massive! It's made of a sturdy plastic, requires three AA batteries (included) and retails for $39.99. 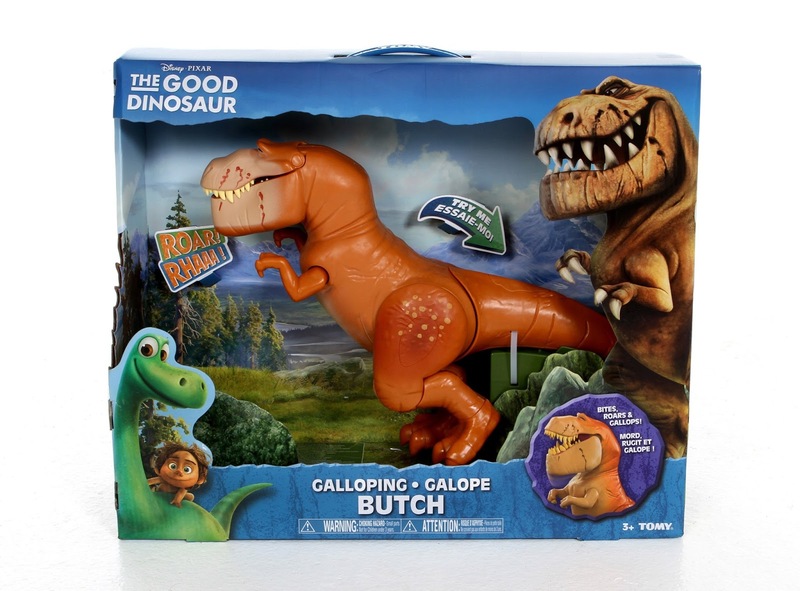 Just hold onto Butch while pressing the button on his tail and watch his legs move in a galloping motion! 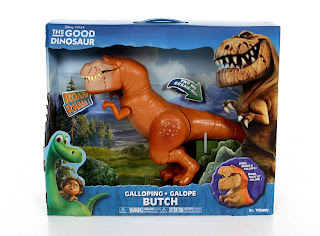 As he "gallops", Butch also lunges forward with chomping action and with various galloping sounds, roars and movie phrases. 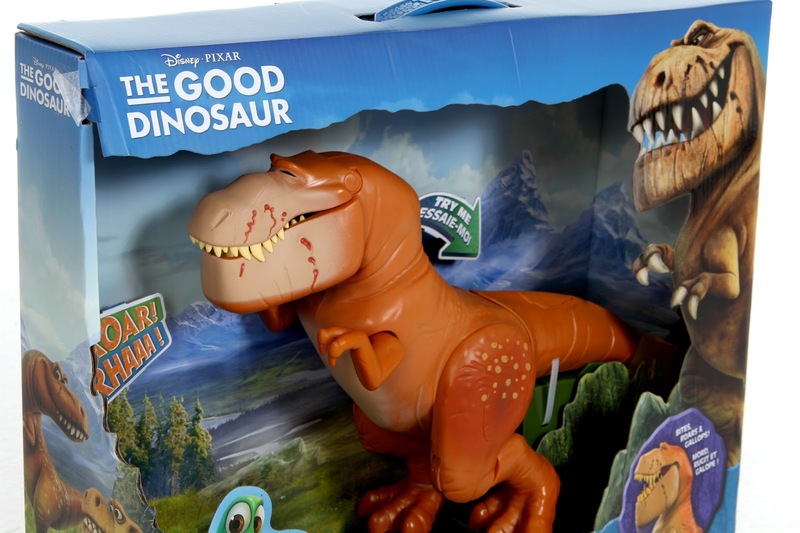 You can also hear his sounds without the galloping (but with an opening mouth) by pressing down on his little T-Rex arms. On the side of Butch, there is a switch with three modes: ENG, Sound FX (a little speaker icon) and Off. ENG is, I'm assuming, referring to English. That's where you'll here most of the movie phrases. When switched to the little speaker icon, you'll hear mostly sound effects (such as roars and growls). "We got longhorns to round up." "At first light, we ride." Check out my brief video below to see it in action! You can also view TOMY's official promo video for the toy HERE. A common misconception with this toy is that he gallops around the house all on his own. This has led to numerous silly negative reviews, as many have purchased it with that in mind. I've seen many reviews actually say that they were disappointed because when they stood him up on his own and pressed the button, he fell over (expecting him to start galloping around). SO I just wanted to clarify here: you have to be holding Butch while pressing the button in order to achieve the galloping effect (as seen in the promo video and on the back of the package). 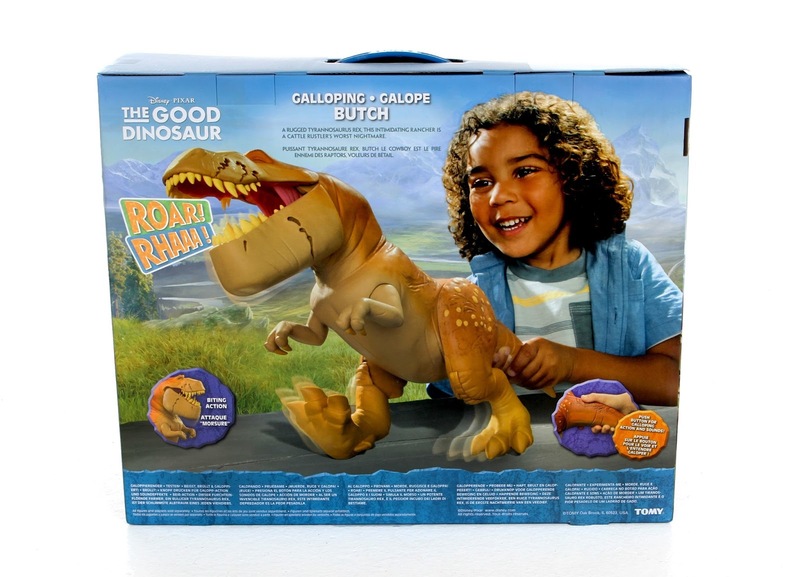 All in all, I think this is a really cool dinosaur toy. A lot of young kids will have a blast with it for sure! My age recommendation for this is for kids 4+ (since it is relatively heavy to hold while simultaneously pressing the button ). You can find this in stores now (I've seen it all over at stores like Target and Toys R Us) or on Amazon using the direct link below!